The Bolt1509 pressure cleaner is a Light Trade cleaner but borders on being classified as an Industrial pressure washer. 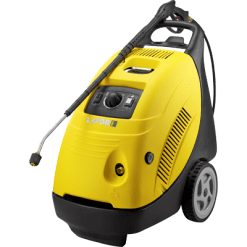 The unit comes with a 3.0KW induction motor (4 pole) and is a low revving 1450RPM motor and pump configuration. The majority of units in this category of the market are usually 2 pole motors, revving at 2800 RPM. 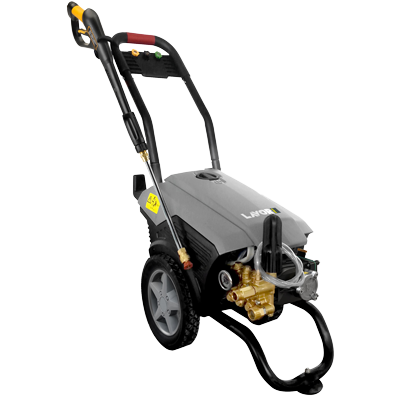 That is why this specific cold water pressure washer is a standout in its field. A Lavor crankshaft pump is standard, where the water going through the pump only touches the brass pump head and the ceramic coated pistons as it is pressurised so as to reduce any corrosion and surface wear to an absolute minimum. An adjustable pressure gauge is fitted on the pump head which gives the user the ability to quickly adjust pressure. A maximum operating pressure of 2200PSI at 9 litres per minute can be selected. Ultimately, this allows you to monitor and set the required operating pressure to whatever is needed for the cleaning task at hand. 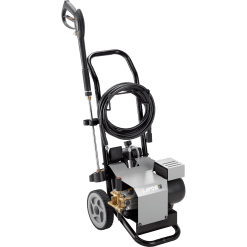 A heavy duty metal gun and lance, an array of different spray nozzles and a 12 metre steel braided HP hose come standard with this pressure washer. This cleaner is a real performer in this particular category and as outlined earlier, can handle a bit of work.